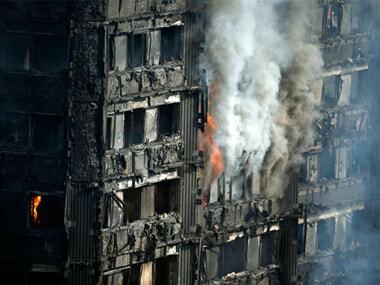 London: The British government on Sunday is scrambling to contain political fallout from the London high-rise inferno that has claimed at least 58 lives. Prime Minister Theresa May says more help will be sent to the scene to help survivors cope and find alternative housing now that the 24-story Grenfell Tower is destroyed. "I have ordered that more staff be deployed across the area, wearing high visibility clothing, so they can easily be found, dispense advice and ensure the right support is provided," May said after a meeting with survivors at her Downing Street office on Saturday. The cause of Wednesday's blaze is still under investigation, but anger has mounted in the community amid reports that exterior paneling may have spread the flames. There has also been a public outcry at the government's initial failure to provide up-to-the minute information. 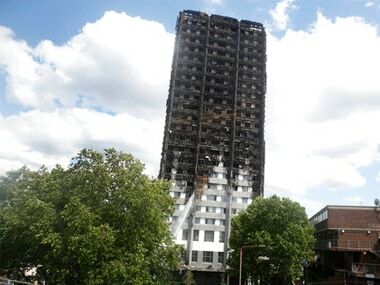 May, criticised in the first few days after the blaze for failing to meet with victims, says the public inquiry looking into the tragedy will report directly to her. She says she will receive daily reports from the stricken neighborhood, where hundreds of people have been displaced. Anger among residents has been mounting in recent days as information about the missing has been scanty and efforts to find temporary housing have faltered. The Home Office said late on Saturday night it will make arrangements for the family of Mohammad Alhajali to "travel to the UK in these terribly sad circumstances." His family said in a statement that Alhajali "came to the UK because he had ambitions and aims for his life and for his family." Police say at least 58 people are either confirmed or presumed dead, with the figure likely to rise in coming days. Other victims have been named by their families. Officials are using dental records, fingerprints and DNA samples to try and positively identify victims. They say they will also use visual elements like tattoos and scars, in the painstaking process. Sixteen bodies have been taken to a mortuary for examination.